Schoharie County is a county located in the U.S. state of New York. As of the 2010 census, the population was 32,749. The county seat is Schoharie. The name of the county and the county seat come from a Mohawk word meaning "floating driftwood." 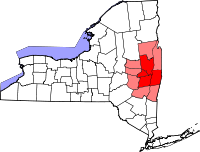 Schoharie County is part of the Albany-Schenectady-Troy, NY Metropolitan Statistical Area. The large territory of the county (much of upstate and western New York) was long occupied by the Mohawk Indians and, to the west, other four tribes of the Iroquois League (increased to six with the migration of the Tuscarora from the South to New York in 1722). After European colonization of the Northeast started, the Mohawk had a lucrative fur trade with the French coming down from Canada, as well as the early Dutch colonists, and later British and German colonists. Some Palatine Germans, who worked in camps on the Hudson to pay off their passage in 1710, later settled in this county in the 1720s and 30s. In addition, Scots-Irish immigrants settled in the present Schoharie County area before the American Revolutionary War, especially near Cherry Creek. After Great Britain defeated the Dutch and took over their colony in 1664, they began to establish counties in the New York territory in 1683. The present Schoharie County was first part of Albany County. This was an enormous county, including the northern part of New York State as well as all of the present State of Vermont. In theory, it extended westward to the Pacific Ocean, as the colonists wanted to keep their options open. This county was reduced in size on July 3, 1766 by the creation of Cumberland County, and further on March 16, 1770 by the creation of Gloucester County, both containing territory now part of Vermont. On March 12, 1772, what was left of Albany County was split into three parts, one remaining under the name Albany County. Tryon County was formed from the western portion of the territory (and thus, since no western boundary was specified, theoretically still extended west to the Pacific). The eastern boundary of Tryon County was approximately five miles west of the present city of Schenectady, and the county included the western part of the Adirondack Mountains and the area west of the West Branch of the Delaware River. The area then designated as Tryon County was eventually organized into what are now 37 counties of New York State. The county was named for William Tryon, colonial governor of New York. In the years prior to 1776, as social and political tensions rose in the colony, most of the Loyalists in Tryon County, then on the frontier, fled to Canada. In 1784, following the peace treaty that ended the Revolutionary War and establishment of states, the new government changed the name of Tryon County. They renamed it as Montgomery County to honor United States General Richard Montgomery, who had captured several places in Canada and died trying to capture the city of Quebec. The state continued to organize new counties. In 1789, Montgomery County was reduced in size by the splitting off of Ontario County. It was originally much larger than the present county, including present-day Allegany, Cattaraugus, Chautauqua, Erie, Genesee, Livingston, Monroe, Niagara, Orleans, Steuben, Wyoming, Yates, and part of Schuyler and Wayne counties. In 1791, Otsego County was one of three counties split off from Montgomery (the other two being Herkimer and Tioga County). In 1795, Schoharie County was created by joining portions of Otsego and Albany counties. This was an area of fighting during the American Revolutionary War. On the frontier, colonists were subject to raids by British and their Iroquois allies. Four of the six tribes allied with the British, hoping to repel the colonists from their territory. According to the U.S. Census Bureau, the county has a total area of 626 square miles (1,620 km2), of which 622 square miles (1,610 km2) is land and 4.5 square miles (12 km2) (0.7%) is water. Schoharie County is in central New York State, west of Albany and southeast of Utica. Much of the southern portion of the county lies within the Catskill Mountains. Land rises in both directions quite rapidly from Schoharie Creek in the middle of the county. In contrast, the northern part of the county is predominately small hills and valleys. More than 75% of the county's population lives in the north, closer to the Mohawk River, the historic transportation route east and west through the state. Schoharie Creek is a northward-flowing tributary of the Mohawk River. The Schoharie Creek watershed spans an area of approximately 950 square miles (2,500 km2). The course of Schoharie Creek includes two reservoir-dam systems. The Gilboa Dam and the Schoharie Reservoir are part of the New York City Water Supply System. The New York Power Authority operates the Blenheim-Gilboa Dam and its reservoir to produce hydroelectric power. The headwaters of the Delaware River is located in the Town of Jefferson. Tributaries of the Susquehanna River are located in the Towns of Jefferson and Summit. The highest point is found at the summit of Huntersfield Mountain on the southern boundary with Greene County, at 3,423 feet (1,043 m) above sea level. The lowest point is where the Montgomery County line meets Schoharie Creek, 520 feet (158 m) above sea level. The most prominent geological feature is Vroman's Nose, near the village of Middleburgh, New York in the Town of Fulton. As of the census of 2000, there were 31,582 people, 11,991 households and 8,177 families residing in the county. The population density was 51 people per square mile (20/km²). There were 15,915 housing units at an average density of 26 per square mile (10/km²). The racial makeup of the county was 95.06% White, 2.14% Black or African American, 0.30% Native American, 0.49% Asian, 0.02% Pacific Islander, 0.36% from other races, and 0.93% from two or more races. 1.86% of the population were Hispanic or Latino of any race. 20.9% were of German, 15.6% Irish, 11.5% American, 10.8% Italian and 9.7% English ancestry according to Census 2000. 95.5% spoke English, 1.7% Spanish and 1.0% German as their first language. There were 11,991 households out of which 31.20% had children under the age of 18 living with them, 54.20% were married couples living together, 9.30% had a female householder with no husband present, and 31.80% were non-families. 25.80% of all households were made up of individuals and 11.70% had someone living alone who was 65 years of age or older. The average household size was 2.49 and the average family size was 2.98. In the county, the population was spread out with 24.00% under the age of 18, 10.60% from 18 to 24, 26.20% from 25 to 44, 24.40% from 45 to 64, and 14.90% who were 65 years of age or older. The median age was 38 years. For every 100 females there were 99.00 males. For every 100 females age 18 and over, there were 97.80 males. The median income for a household in the county was $36,585, and the median income for a family was $43,118. Males had a median income of $31,725 versus $24,475 for females. The per capita income for the county was $17,778. About 7.90% of families and 11.40% of the population were below the poverty line, including 13.70% of those under age 18 and 8.60% of those age 65 or over. The primary industry of Schoharie County is agriculture. Farms are situated all over the County and farm stands and other agriculture related businesses are operated throughout the County. Many residents work in the Capital District, New York. Wal-Mart has a distribution center located in the Village of Sharon Springs. The I-88 corridor is growing due to the short commute to Schenectady and Albany. The Catskills-area villages have a number of historic hotels, as it was a vacation destination in the early 20th century. Second homes are popular in the County. A growing tourist industry attracts visitors for recreation, the landscape and historic destinations. Visitors come to visit Howe Caverns, Secret Caverns, the Carrot Barn, the Apple Barrel Country Store and Cafe, Vroman's Nose, the Old Stone Fort, and the Iroquois Indian Museum. The Old Blenheim Bridge was among the attractions, but it was destroyed by Hurricane Irene in August 2011. Work to rebuild the covered bridge commenced in 2017. A prominent site in the county is the Old Stone Fort, used for defense against British and allied Indian attacks during the Revolution. It was later used as an armory during the Civil War. During the nineteenth century, the Middleburgh-Schoharie Railroad was constructed through the county. In 1981 the Iroquois Indian Museum opened in a new building near Howe Caverns in the town of Cobleskill, New York. It has the largest collection of Iroquois art in the United States. The museum includes a performance center, where Iroquois present traditional and contemporary music and dance. The Gilboa Fossil Forest is home to one of the Earth's oldest forests, with petrified tree trunks dating back over 380 million years to the Devonian period. Numerous fossils are on display at the Gilboa Museum near the Schoharie Reservoir. The novel Midnight's Lair (1983) by Richard Laymon was about explorers trapped in Howe Caverns. David Letterman, a late-night TV host, did a parody about the town of Schoharie. The two season reality series, The Fabulous Beekman Boys was set in Sharon Springs. In August 2010, the series Ghost Hunters filmed an episode about the Old Stone Fort; it aired December 8, 2010. A finalist on Tila Tequila took the show to the bowling alley in Cobleskill. The Boulder, Colorado Jam band String Cheese Incident mentions Schohaire County in the song 100 Year Flood. ^ a b "State & County QuickFacts". United States Census Bureau. http://quickfacts.census.gov/qfd/states/36/36095.html. Retrieved October 13, 2013. This page uses content from the English language Wikipedia. The original content was at Schoharie County, New York. The list of authors can be seen in the page history. As with this Familypedia wiki, the content of Wikipedia is available under the Creative Commons License.